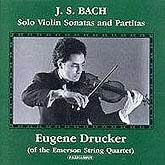 Eugene Drucker, a student of Oscar Shumsky, is a founding member of the Emerson Quartet. With this ensemble he plays more than 100 concerts a year. But he continues to make time for independent projects, including his annual appearances with the Berkshire Bach Ensemble in its New Year’s Eve/New Year’s Day performances of the Brandenburg Concertos. His Bach performances are the fruit of long consideration and study, reflected in his own program notes for this recording.